This module contains a series of novel parallel algorithms to perform suffix-sorting and BWT construction of very large texts and text collections. For example, the single string BWT construction can be used to index the whole human genome in under 2 minutes on a Tesla K20 GPU with 5GB of device memory and 16GB of system memory - while the string-set BWT construction algorithm has been tested with up to 500M x 100bp reads on a system with the same GPU and as little as 32GB of system memory. The functions are split into two groups: functions that operate on host-side strings and string-sets, and functions that operate on device-side strings and string-sets. The latter are grouped into the cuda namespace. 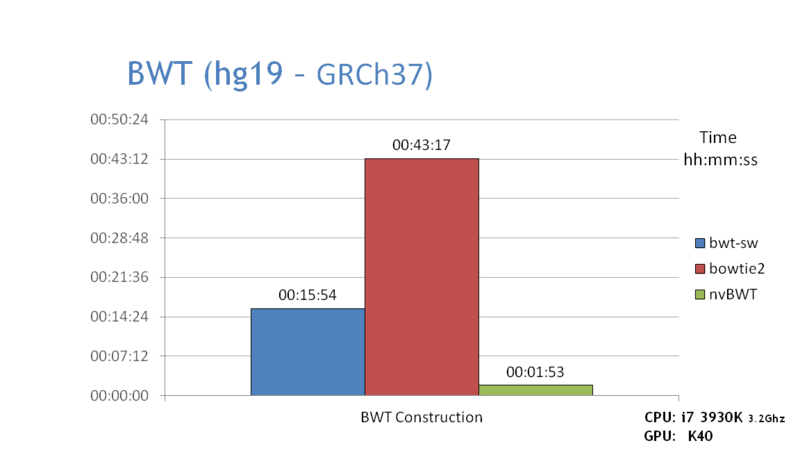 The large string BWT construction uses a GPU implementation of J.Kaerkkaeinen's Blockwise Suffix Sorting framework, customized around a new GPU-based block sorter that employs a mixture of a novel, high-performance MSB radix sorting algorithm and a high-period DCS sorter. The resulting algorithm can sort strings containing several billion characters at up to 70M suffixes/s on a Tesla K40, and is practically insensitive to LCP length. "GPU-Accelerated BWT Construction for Large Collection of Short Reads"
A complete list of the classes and functions in this module is given in the Sufsort Module documentation.